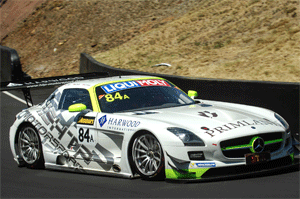 Harold Primat kicked off his 2014 international GT season in style by clinching a magnificent second place finish in what turned out to be a rollercoaster ride at the Bathurst 12 Hour on Sunday (February 9). It was a stunning fight back from the #84 HTP Motorsport crew of Primat, Thomas Jaeger and Maximilian Buhk, who took the chequered flag a mere 0.413sec adrift of the victorious #88 il Bello Rosso Ferrari, despite finding themselves two laps down following contact with the #32 NISMO Nissan during the opening stint. The #84 machine was also the first Mercedes-Benz SLS AMG GT3 home. Even before the race HTP Motorsport had faced a steep learning curve as the German squad – making their Bathurst debut – worked hard to find a suitable set-up for the daunting and challenging Mount Panorama circuit. What’s more, the team came close to withdrawing on Friday following a serious accident that required its mechanics to graft through the night to repair the damage. And it was their unflinching dedication that ensured the car was ready for Saturday’s qualifying sessions. Come Sunday’s race Jaeger made a great start from 11th on the grid to vie for second in the opening stint. That charge had included slight contact with the #32 NISMO Nissan, however, which would later cause a problem with the right front wheel. Fortunately the issue could wait until Jaeger’s next pit-stop, during which the car lost two laps while the damage was fixed, before Primat climbed aboard. Determined to make amends, the Swiss ace and his German co-drivers then embarked upon a dogged fight back, scything through the field to close in on the frontrunners. It was Primat’s mega final stint that finally hauled the HTP Mercedes on to the lead lap once again, and after briefly taking the lead he handed over to Buhk. Despite dropping to third, the youngster’s similarly relentless pursuit helped him reel in and pass the #88 Ferrari and #63 Erebus Motorsport Mercedes, before building a comfortable lead ahead of what should have been a routine final fuel stop. It was only then that the team noticed one of the front brake pads had completely worn, which necessitated a further delay while it was replaced. Buhk wasn’t finished yet though and, after reclaiming third and then second places, was offered a glimmer of hope thanks to a late-race Safety Car period that negated the leading Ferrari’s advantage. A fierce, no-holds-barred scrap for the win duly ensued, with Buhk trying everything to pass Bathurst legend Craig Lowndes, who ultimately held on for victory by the narrowest of margins. Nevertheless, second place still felt like a win for Primat after he and HTP Motorsport overcame various pitfalls throughout the weekend. Harold Primat: “What an amazing story! I had an incredible weekend at Bathurst, and perhaps even the craziest of my entire racing career. At first we weren’t happy with the car’s set-up and then suffered a heavy accident. Fortunately, the HTP Motorsport mechanics did a fantastic job and worked very hard to have the car up and running on Saturday. I’d like to extend them my warmest thanks. “As the weekend progressed we were still improving the set-up right until the very last minute. In fact, we took quite a gamble by changing many things just before the start. Thomas did a great job during his opening stint before we lost two laps because of a slight coming together with another car. Despite the odds being stacked against us we never gave up and kept on fighting until the very end. During my second stint the team asked me to stay out a little longer so we could un-lap ourselves. I drove well through the traffic before handing the car over to Maximilian, who stormed to the finish despite encountering brake pad issues. Harold’s busy 2014 schedule continues with the season’s opening VLN round at the Nurburgring on March 29.